In recent weeks, the debate about rugby in South Africa ‘going 100% private’ has been rekindled in the wake of a spat at Western Province. To briefly recap, the so-called professional arm of WP Rugby (WPR), the Board, have decided on implementing an ‘exit strategy’ for assistant coach Paul Treu after pressure from the players to oust him. The executive committee (Exco) of the WP Rugby Football Union (WPRFU), the amateur elected officials, object and want Treu to stay on and replace Gert Smal as director of rugby. You can already see the problem can’t you? The WPRFU wholly owns WPR (professional arm), which falls under its umbrella. The professionals can’t make a move without the amateurs having a definitive say. It’s a system that repeats itself throughout South African rugby and even at the mother body SA Rugby, where professionals are paid to make big decisions only to have them undermined by amateur officials who have election manifestos to fulfil. So the concept of wholly privatising rugby in this country is good in theory, but far more difficult to achieve in reality. If, for example, new WP president Zelt Marais wanted to give the professional unit of the union 100% autonomy, he would have to lobby his constituents (the clubs) to have the WPRFU constitution changed. They would effectively have to vote to release all power over the professional unit and let it break from the shade of the WPRFU umbrella. In other words, they would give up access to the money the pro side of the game generates. How do you think that vote would go? The complexities of changing rugby from an amateur sport to a fully-fledged pro sport are massive – both globally and in South Africa. SA Rugby chief executive Jurie Roux summed it up in an interview with Rugby World Magazine in the UK last year: “I think people forget that Francois Pienaar was an amateur player when he captained the Springboks to the World Cup in 1995 and the transition from amateurism to professionalism was achieved in the blink of an eye,” Roux said. In SA, rugby unions play a vital role in running the game at grassroots level and in that context they are important structures. Schools, clubs, women’s rugby (which isn’t professional yet), development and referees all have to be organised. In this country it is the rugby union which does that, supposedly staffed by enthusiastic amateurs who do it for the love of the game. But somewhere along the line, when money entered the sport at the top end, those amateurs believed they were entitled to their share, blurring the roles and needs of professional and amateur rugby. Professional rugby should be completely separate. Money generated by the professional game, should be used for the improvement of the pro game, for recruiting and developing players, hiring the best coaches and support staff and marketing the brand. Manchester United and Liverpool do not fund hundreds of Sunday League clubs throughout their regions – that’s left to other bodies to maintain and run. But in SA, the Stormers and Lions are effectively professional entities used to fund club rugby in Tygerberg and Roodepoort. Considering amateur officials are highly unlikely to vote in favour of removing their hands from a diminishing professional till, what are the alternatives for a pro league? We’re talking about a revolution of massive proportions, with at least five teams to successfully break away from the formal structures of rugby in this country. It would also require a billionaire benefactor(s) who is willing to fund these professional teams for several years to achieve a clean break. If the benefactor offered to fund five squads of the best talent in SA, with a few international superstars thrown in, the game would be revolutionised like Kerry Packer did to Australian, and global, cricket in the 1970s. Initially there would be resistance and those players that migrated to play for the Durban Sardines, the Jozi Thunderclouds or the Cape Seals would be left to play in a competition between themselves until the remnants of the former professional sides ceased to exist. The new franchises, staffed by the best players and coaches and playing in Cape Town Stadium, Moses Mabhida, Orlando Stadium and elsewhere would quickly gain traction. SANZAAR licenses to play in Super Rugby can be awarded to any franchise the organisation sees fit, while the new entities could also start collective negotiation to play in Europe. It might seem a fantastical concept, but professional rugby cannot continue to drag the amateur parachute. The game faces an ultimatum: revolution or a slow death. Good article, I have been saying this for a while now. There really is no place for government interference in professional sport. In fact, its stipulated in the World Rugby constitution that any gender or race-based discrimination is grounds for banning, so I don’t know how SARU still manages to play rugby under World Rugby banner. Get SARU kicked out and a split would be a lot easier to engineer amongst Pro Players who suddenly don’t have anyone to play with. Perhaps the Players Union needs to get the ball rolling by approaching that rich guy in Western Arsetralia who has started his own competition, get Remgro involved, maybe a big Japanese Sponsor and perhaps some of the rich French Arabs. I suspect 3 Professional Franchises would be relatively easy to staff, fund and establish. With SARU moving away from contracting players and only paying match fees I’m sure pro players would much prefer lucrative contracts at a strong Franchise where you are picked purely upon merit. But then,—this is all pie in the sky because who knows if the lights will even be on when they start playing Super Rugby this year. The obvious question is where does country stand when it comes to internationals. Does this mean our international side will exclude players from the breakaway pro outfits? I get you on the load shedding. I have had it between 4:00PM and 6:00PM the last two evenings. Guess what the Stormers/Bulls game starts at 4 on Saturday. Yes there are contingency plans in place but the blackouts are erratic regardless of where you are. It is a worthy subject Craig, though I don’t think that the current WP crisis should be used as an example or yard stick. The problems at WP are multi faceted and go well and beyond just amateur Vs professional. Most media reports are unsubstantiated and one sided – the reality is that we do not have all the facts to make a meaningful decision! I think that it would me a more meaningful exercise to look at the other three unions as a current and normal state of play in SA pro rugby. They are certainly not without their problems, but they do portray a healthier image than that currently haunting WP! SA Rugby has made some headway, to be fair, by limiting the number of Pro players. This will assist, provided the additional funds find their way into the correct coffers. Beyond that though, there is not much more that can be done until the issue of private shareholding has been addressed. No company would willingly invest in an entity that they do not have control of and that is run by Amateurs. Remgro is of course one of the exceptions, but even they have tried to hit reverse! Maybe a one time divorce bill from the pro side of WP to the clubs could work if they can find a angel investor and the amount is right. Everyone has a price and I doubt the amateur side of WP will consider their long term power over a big pile of cash put in front of them. Basically a bribe to get WP out. Not that unusual in SA these days. Just another unsubstantiated article written from an antagonistic perspective. In another article on another rugby website, most of these allegations have been refuted. I did not see any “allegations” in the article. This is an opinion piece, not a factual report. As such it is interesting, but a little out there. The South African economy is at death’s door. Who is going to finance a rebel league? It has to be a viable business. 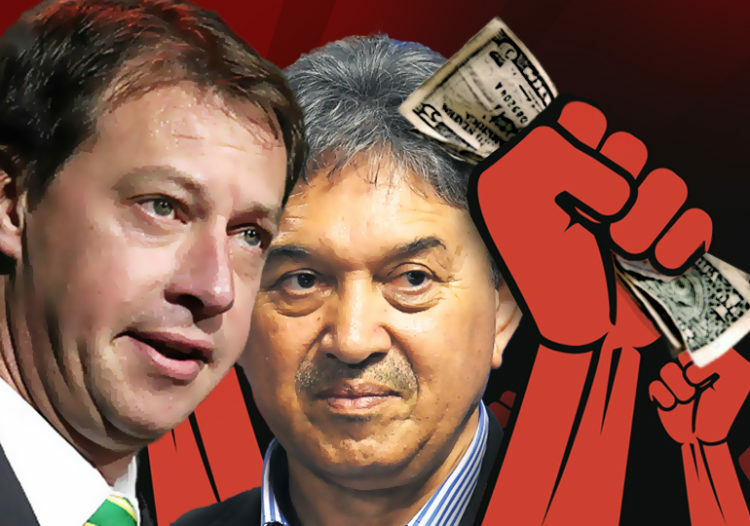 In the end, the economy and politics will kill professional rugby in SA. But it is going to be a slow and agonizing death. Junior rugby may continue and serve as a feeder for overseas professional clubs. All the signs are indicating the death throes of SA rugby. It’s been clinging on for dear life the past decade or so, but the terminal phase is looming. Anyway, how can anything in our country thrive as it spirals downward? Why would rugby be the exception? RIP! The recent drama at WP is a simptom of something bigger than the question of Privatisation or not. Similar systems are in place at other unions and if this latest conclusion holds water then why does the Lions etc prosper? It appears if there is a cosy buddy system in place at WP. Performance on the field is not important and the coaching staff is not held accountable. Sure, they dream about winning etc but there is no substance behind it. Everyone is happy if the coach can explain the loss after a game (with some creative excuse) and if the supporters is satisfied with the explanation. It is unthinkable that any CEO or high level coach will survive 3 years of mediocre performance especially with the extensive player resources that they have available at WP. Yet it remains business as usual in the Cape of Storms. Danie Craven saw this coming. Money has killed the game, all administrators are thieving, players now play for money and not because they want to play. Super Rugby is dead. Rugby Championship is a farce and we have murdered the Currie Cup in the quest from Money (by the administrators) and by the way, there are so many rules to “speed up the game” they they actually slow the game down.